Pack up the gear and head out for the story. Many writers hate to leave their desks. They are secure there and comfy in loose clothes, and technology is their enabler. Why leave the laptop when the Internet makes research so easy and interviews come via email? But does this facilitate the best writing? Not always. When the isolated writing approach is not working, it’s time to pack up that laptop, walk out the door, and do the research, interviews and writing on location. “Location” is where skills advance on several levels. During a face-to-face interview, we discover the inevitable story behind the story. We notice the Purple Heart certificate on a baker’s wall, adding character dimensions beyond the baking abilities we’re discussing for a wedding magazine. Working on location, especially for those in-the-field stories, yields better descriptions, too. For an article on labyrinths, I could understand the inherent calming experience only by walking in a labyrinth at a local church. And for a health magazine, when I visited a neurologist’s office, I could smell the paste holding electrodes to my scalp and view brainwaves in the form of rainbow-colored bands on monitors. On location, we engage our five senses, making settings, stories and characters more accurate and fully formed. But what equipment do we take, how do we pack it and in what type of backpack to make these live experiences live on the page? Over the years, I’ve learned that writing equipment includes even seemingly unrelated items, such as a plastic ruler. Why guess at the length of a sea urchin’s orange spines when a ruler held against aquarium glass at Channel Island National Park yields an exact dimension? Why disregard that quickly moving speck on the distant mountain you’re describing when packed binoculars reveal a bobcat, whose presence adds action to your story? I pack a magnifying glass, too, which I used to examine pottery shards at one historic home, and my flashlight highlighted the discarded objects beneath the porch. A travel pillow becomes a writer’s tool, as well. Fully inflated, it’s a cushion, which I sat on atop a tile wall, writing about an area’s long-vanished Chinese village. The pillow can double as a laptop desk and as an actual pillow when I lie in the grass to better describe a spiraling buzzard. Scissors and small plastic bags come in handy when someone offers a clipping from the rare flower that’s the subject of your writing. And matches. When the VIP you’ve waited months to interview pulls out a cigarette but has no way to light it, he or she won’t need to leave your hard-won interview to find a light. When selecting a backpack, consider three writing-related factors: space, accessibility and durability. Taking a laptop and camera on location dictates the size of backpack, and you’ll want plenty of zippered pockets to accommodate paperclips, rubber bands and sticky notes. 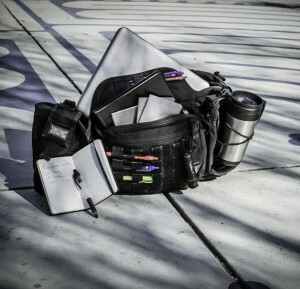 External loops are necessary for quick access to pens, magnifying glass, ruler and mini-flashlight, and compartments for water bottle and travel mug are important. Pack some teabags, too, for sun tea. Easy access is my main factor in choosing my sling-style backpack, which swings back to front, allowing instant access without removing the pack. Why miss a chance to jot down important story elements such as a child’s unique costume on a passing float or the colors of a hot air balloon disappearing over a hill? Durability counts, too, including shock-absorbing padding for tape recorder and camera, and fabric should withstand any environment. Waterproofing is essential for when that water skier you’re writing about zooms by, soaking both you and your backpack. Search labels for the words “water-repellent” and “abrasion resistant.” The words “paracord zipper loops,” “rip-stop nylon” and “military-grade” also sold me on my pack. While these tips have been primarily for the reporter or nonfiction writer, working on location and using the five senses have implications for fiction, too. To create your fashionista chic-lit protagonist, take your work to a fashion district and make note of the styles. If your sci-fi-fantasy space gnomes reside in forests, write in the woods; smell the pines. Frequent arcades where your YA characters hang out; listen to the sounds those games make. For murder mysteries, visit less-than-pleasant locations. I navigated the three-mile potholed road down a dead-end canyon where an actual murder victim’s body was once dumped. The place is eerie; it scares me. But that’s what we want in these cases: to experience the terror our protagonists feel. Emerging from behind the desk could lead you anywhere. With luck, you’ll receive unexpected invitations for skydiving, riding on an oil barge or exploring an archeological dig. As a backpack writer, though, with the right equipment, you’ll be prepared. —Sarah Howery Hart is the author of the murder mystery, Catch ’n Release: The Game and teaches writing classes, including at the Ojai Wordfest and Writers Conference.